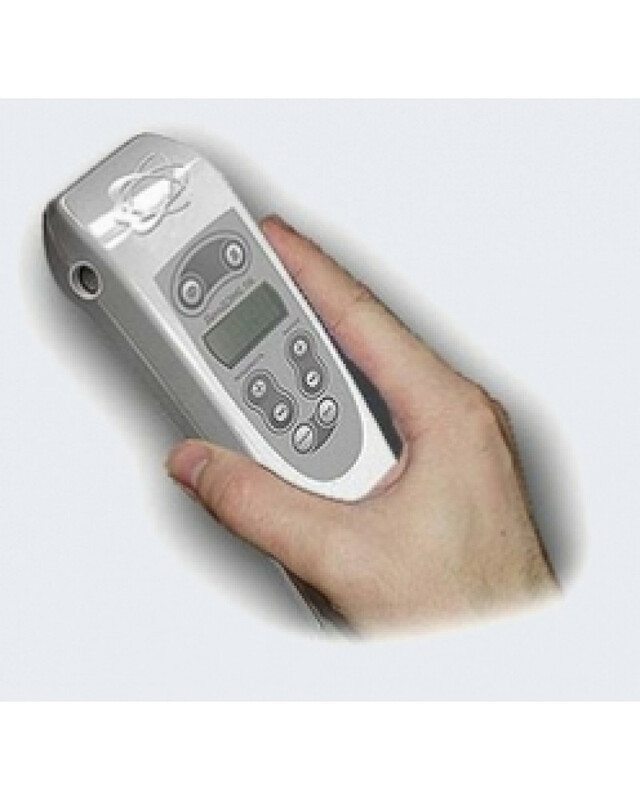 most effective methods of modern physiotherapy – dynamic electroneurostimulation (DENS). This method consists of exposure of microcurrents to skin receptors, which evokes responses in organs and tissues. The DENS method is effective for treatment of acute respiratory diseases, headache and toothache, menstrual pain, muscle and joint pain, and osteochondrosis pain. The device alleviates inflammation edema and promotes healing of wounds, fractures and burns. DiaDENS-PC is a curative and diagnostic complex, which provides its user with boundless DENS opportunities , and allows diagnosis and tracking of treatment results through the four most effective diagnostic methods. - five diagnostic modes ('Foll,’ ‘Biofoll,’ ‘Biorepair,” MiniAS and ‘Screening’). The device is connectable to a PC and is supplied with software for diagnostic process management as well as storage and evaluation of the results received. PC software comes with the device. It is easy and quick to install on almost any PC and easy-to-use. Plug connectors for connection of therapeutic and diagnostic remote electrodes (which come with the device) are located on the body of the device. 140Hz and 200Hz therapeutic frequencies are applied to the direct projection of the complaint. An effect can be achieved in the first minutes of treatment and lasts from several minutes to an hour. To enhance a curative effect, exposure of the device may be continued at the lower frequency. Indications: Full-blown pain associated with locomotor system diseases and affections, and pathology of the peripheral nervous system. Therapeutic frequencies of 60Hz and 77Hz are applied to the direct projection of the complaint and segmental areas. An effect appears in 15-30 minutes and lasts for 1-1.5 hours and even longer. Indications: Functional disturbances and pain syndromes of internal diseases and during a postoperative period. Therapeutic frequencies of 10Hz and 20Hz are applied to the direct projection of the complaint, segmental and universal areas. A maximum curative effect develops in 20-60 minutes and lasts for several hours. Indications: Functional disturbances and pain syndromes of internal and locomotor system diseases, treatment during a postoperative period. 1.0Hz-9.9Hz therapeutic frequency is used for treatment of hypertension, headache, inflammation, neuralgia, arthritis, arthrosis and many other diseases. Please find the full list of indications in the table. The ‘Screening’ mode allows the choice of optimal areas of exposure for improvement of the systemic DENS effect and detection of hidden problem zones through analysis of an increase in the rate of electrical impedance of the skin in the areas around the selected area. The MED mode (Minimal Effective Dose)should be used in cases of expected physical or brainwork, physical and mental strain, and for prevention of colds during epidemics. The ‘Test’ mode is intended for a search of problem spots and treatment of skin areas symmetrical to the projection of the complaint. The ‘Foll’ mode allows performance of express-assessment of functional status of internal organs, in-depth assessment of the functional status of internal organs and tests for compatibility with drugs. The ‘Biofoll’ mode is an upgraded version of the classic ‘Foll’ method. Its distinctive feature is the possibility of performing measurements with a specially selected test voltage, which allows consideration of the individual characteristics of the body and receipt of a more accurate diagnostic result. The ‘Biorepair’ mode helps to detect the disease at the pre-existing disease stage, to select an optimal DENS treatment regimen and to assess the functional status of internal organs. The ‘MiniAS’ mode makes it possible to use the method of functional electropuncture diagnostics in the microacupuncture systems of the hand, scalp, etc. This method allows assessment of the functional status of affected organs and systems in progress during retesting. Power supply - 6F22 (krona) battery – 1.
in the ‘Therapy’ mode – 10Hz, 20Hz, 60Hz, 77Hz, 140Hz & 200Hz. Information on LCD has few Russian words only , is very easy for understanding. of the DiaDENS – PC. The DiaDENS – PC doesn’t exclusively require connection to the Personal Computer to carry out diagnostic activities. In the event that a computer is not available at the moment of the procedure, diagnostic works can easily be arranged in the autonomous mode. THERAPY is a regime represented by rather wide range of frequencies, i.e. from 1 Hz to 200 Hz. Therapeutic regime “7710” and 77 AM work to directly improve the state of nervous and cardiovascular systems. MED is a treatment and prophylaxis program. SCRINING is a regime used to quickly find the trigger points to be worked on during the treatment session. 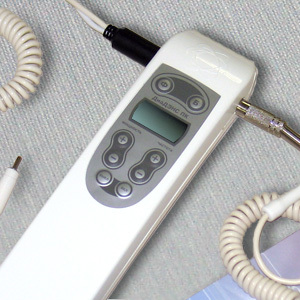 BIOREPER is an advanced method of the Electropuncture Auricular Diagnostics. VOLL is the method of the Electropuncture Meridional Diagnostics and medication testing. 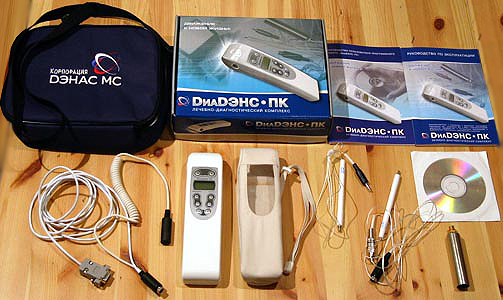 The DiaDENS - PC apparatus can easily be supplied with the external electrodes, i.e. DENS-Glasses, DENS-Applicator or a corporeal electrode. Frequencies: Frequency settings possible with the apparatus are from 1 to 9.9 Hz (0.1 Hz grid), 10, 20, 60, 77, 140, 200 Hz. The apparatus generates bipolar electrical pulses able to dynamically adapt the changes of the skin impedance. -New relaxation technique - “77 10” which also help to reduce high blood pressure. -New technique “77 AM” - very stimulating, refreshing. It can be used for treating hypoactive, weak people. -Ultra low Dr. Voll bioresonance frequencies from 1 up to 9.9 Hz specifically defined for particular health problems. 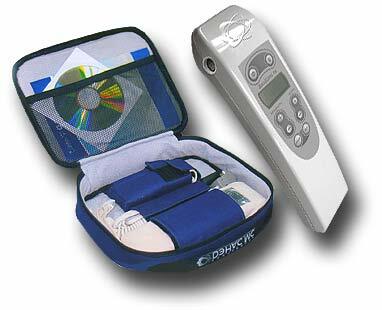 -Famous 10, 20, 60, 77, 140, 200 Hz for pain reduction and treating acute diseases. -New diagnostic programs “BioVOLL”, “Mini AC”, “BioREPER” available. It allows you to define health problems long before their manifestation. -Can be used in combination with a PC computer or independently. You can hook up to your computer, work on it, use diagrams, and save data. You can see below how user conducts a diagnostic procedure. The programs show results.